Even though the temperatures of high Summer are here, the effects of last Winter are still with us, as I discovered when I arrived at the Spitalfields City Farm to meet Helen Galland who has been farmyard manager here for the last seven years. Helen was busy mixing up powdered ewe’s milk and decanting it into bottles with teats for the orphaned lambs – who were fully aware it was feeding time and making loud hungry baaing sounds on the other side of the farmyard. The poor quality grazing occasioned by the severity of last Winter left many ewes unable to feed all their young, hence the number of “orphaned” lambs this year. As we climbed into the sheep pen with bottles in hand, where the noisy young diners were waiting, children in the adjoining playground ran to the fence and asked excitedly if they could feed the lambs. When Helen consented, they sprinted around the block in anticipation to arrive at the pen where Helen handed them the bottles, and much hilarity, delight and mobile phone footage ensued as the thirsty lambs quickly sucked the bottles dry. “Many children grow up in tower blocks and estates where they cannot even have pets,” explained Helen to me later, “so they have no direct contact with animals, which they need to do if they are to learn respect for life and understand that animals have needs.” It was both an eloquent summation of the role of the city farm itself and a heartfelt declaration of a personal creed for Helen, a trained zoologist who works sixty hours each week here with the animals. 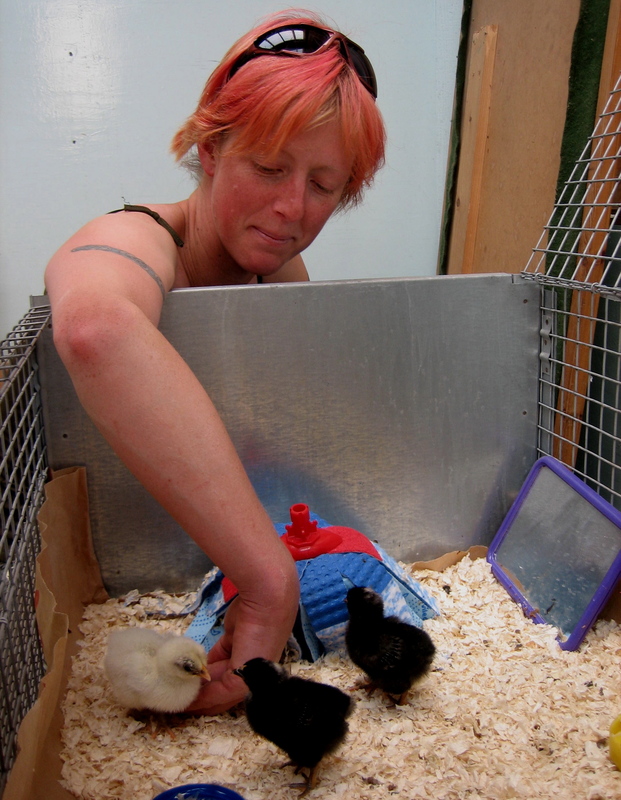 We retreated from the midday sun into the cool of the animal sheds where Helen is rearing chicks to replace two Bantam Blue Orpingtons that died recently. “I wanted to breed them here but I never managed to get a clutch of their eggs so I had to buy some Buff Orpington eggs off the internet.” she explained as she lifted the lid of the cage where she was nurturing the tiny little fluffy birds, stumbling around with stumpy wings like clockwork toys and falling suddenly asleep, even in the feed bowl, as if they needed winding up again. Only one of the six eggs that came through the mail hatched and this single survivor has tested Helen’s ingenuity to rear it successfully, becoming an intense focus for her energies in the process. Deploying cunning old tricks, she placed the head of a mop in the cage where the chick could seek maternal consolation and a mirror so that, like the caged songbird, the chick had a companion to speak with, until two others she loaned from another farm arrived to teach the necessary social skills for a hen. By tapping her finger in the grain and the water, while making the noises of a mother hen, Helen herself taught the Orpington chick to feed. Now at a week old, it runs to her hand and responds to her touch. We were both mesmerised by this helpless creature, quick with life, that had just shed the nib from its beak which enabled it to peck its way out of the egg and into existence. “They get uglier from now on!” quipped Helen, spellbound by her charge. Helen arrives at a quarter to eight every morning and leaves at a quarter to eight in the evening five days a week, all year round, in a job that entails a great detail of manual labour yet which she embraces with an infectious joy. Her tattoos, pink hair and combat pants impart a punky street credibility (closer to Tank Girl than the shepherdesses of yore), that enables her to be an energetic advocate to all the school children that come daily to encounter the different animals, gain respect for their fellow creatures and understand the origins of their food. Like the others who run the farm, Helen is a knowledgeable professional who works hard to tend the livestock, as well as communicating her knowledge and passion for the animals, not forgetting office work and the constant necessity to chase funding to keep the whole enterprise afloat. 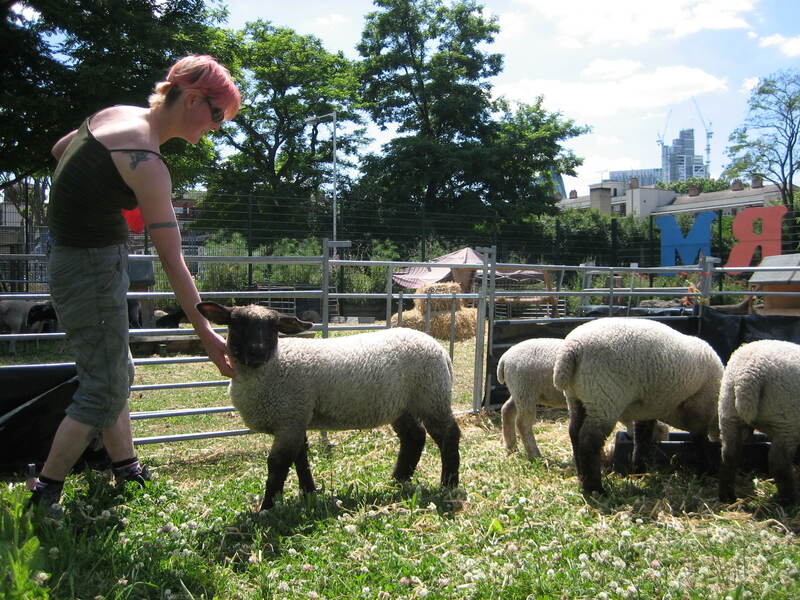 I remember when I first visited the Spitalfields City Farm, walking across a muddy urban wasteland to visit the animals in pens, looking quite forlorn in a former railway siding. Much less verdant than today, it was a curiosity that existed in defiance of its environment, yet remarkably it is still here thanks to the staying power of a few industrious individuals like Helen. I have always loved it for leavening the neighbour with its anachronistic poetry – delivering farmyard sounds, of cockerels crowing and sheep bleating, upon the wind. They bring us down to earth with their age-old cries, because the truth is that the anachronism is not the farm, it the city that surrounds it. And for the benefit of our collective sanity we all need to be reminded of this daily, an essential duty that falls to the modest hens and sheep – this the story of how Helen Galland takes care of the animals and the animals take care of us in return. If you are interested in volunteering to work at the farm or sponsoring an animal click here.